Kelley was born in Rada, West Virginia, on April 13, 1923, and grew up in nearby Keyser. He was the middle child and only son of Jonah and Rebecca Kelley; his two sisters were Beulah and Georgianna. A sports enthusiast, Kelley played football and basketball while attending Keyser High School and also participated in Boy Scouts and activities through his church, Grace United Methodist. 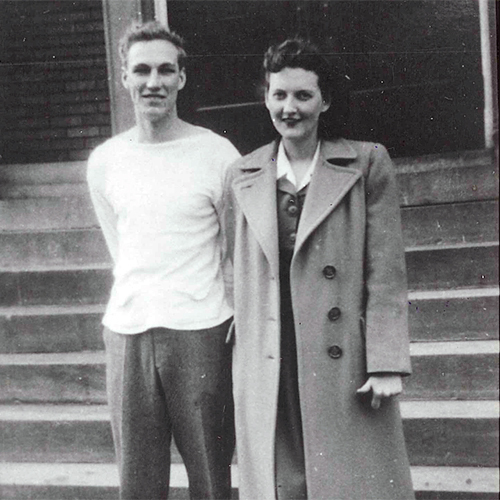 After graduating from high school, he entered Potomac State College where he played on the football team until being drafted into the U.S. Army in 1943. Sent to Germany, Kelley served as a staff sergeant with the 311th Infantry Regiment of the 78th Infantry Division. The division had been fighting for weeks to take the village of Kesternich, south east of Aachen, because occupation of the village would also give control of the nearby Roer River dams. During intense house-to-house fighting on January 30, 1945, Kelley led a squad in repeated assaults on German-held buildings. Although he received two wounds, one of which disabled his left hand, he did not withdraw to seek medical attention but continued to lead his men. The next morning, he single-handedly sought out and killed a German gunner who was preventing his squad’s advance before being killed while assaulting a second German position. 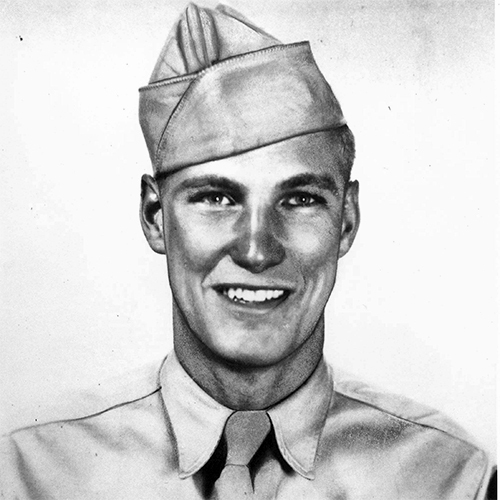 For these actions, he was posthumously awarded the Medal of Honor eight months later, on September 10, 1945. Aged 21 at his death, Kelley was initially buried in Margraten, Netherlands. 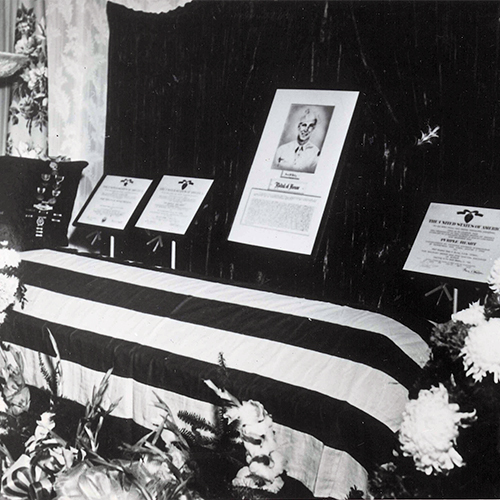 After the war his remains were returned to the U.S. and interred at Queens Point Cemetery in his hometown of Keyser, WV. Edward & Paulina were very close friends. She was first to notify Eddie he would be drafted to WWII. A Pre-Deployment photograph taken of Eddie prior to war. This photo has since been used on all public domains. The funeral did not happen until 3 years after his death. His body was originally buried in Margraten, Netherlands. Ed Kelley Memorial Plaza – Memorials to Kelley have been constructed at the sites of both the new and old Keyser High School. The J. Edward Kelley Society – The J. Edward Kelley Society administers two awards available to people associated with Kelley’s alma mater, Keyser High School. The Ed Kelley Award, established the year after Kelley’s death and awarded annually ever since, is a scholarship available to students who played varsity basketball or football at the school for at least two years. The Legion of Honor, established in 1984, recognizes graduates who distinguished themselves in their careers and others who have supported the school in some way. Jonah E. Kelley Army Reserve Center – An Army Reserve facility at Fort Dix is named the SSG Jonah Kelley Center. Jonah E. Kelley Memorial Bridge – In 2006, legislation introduced to the West Virginia House of Delegates by Representatives Robert Schadler, Allen V. Evans, and Ruth Rowan, all of Mineral County, named a bridge on West Virginia Route 46 in Keyser in honor of Kelley. Construction on the “Staff Sergeant Jonah Edward Kelley Bridge” over New Creek began in November 2006. Jonah Edward Kelley Day – 1992 a music scholarship was established at the Eastman School of Music in Rochester, New York for Kelley, with a special memorial day celebration given by the Mayor of Rochester. Kelley Barracks US Army Base – In 1949, located in the suburb of Moehringen in the southeast corner of Stuttgart, Germany, is a former German military facility that was renamed as the US Army’s “Kelley Barracks” and is today the garrison for Africa Command (AFRICOM). Kelley National Guard Armory – The Medal of Honor Grove at Freedoms Foundation at Valley Forge Pennsylvania contains 52 acres of natural woodland and is designed as a living memorial to the 3447 recipients of our nation’s highest military decoration, the Medal of Honor. Medal of Honor Book – He did not at first zero in on Jonah Edward Kelley of Keyser, West Virginia. Rather, “Kelley picked me” when “I saw Kelley’s impish grin in a photograph,” wrote McWhorter. The story of Jonah Kelley. USAT Sgt. Jonah E. Kelley – The U.S. Army named a transport ship USAT Sgt. Jonah E. Kelley in 1947. When the ship was transferred to the United States Navy in 1950, it became the USNS Sgt. Jonah E. Kelley (T-APC-116). USNS Sgt. Jonah E. Kelley – n October 1949, the Military Sea Transportation Service (MSTS) was established. Five months later, the converted C1-MK-AV1 was transferred to the US Navy for MSTS use and placed in service as USNS Sgt. Jonah E. Kelley (T-APC-116). 78th Lightning Division Memorial – Statue built in Wappinger Falls, N.Y., in honor of the 78th Lightning Division. The significance of the statue as it related to Ed Kelley is that the shoulder patch on the kneeling soldier is the 78th Lightning Division and hanging from the rifle is a set of dog tags engraved with Ed Kelley’s army serial number. The Memorial was dedicated in 1993.